Learn What are the Problems? The Kalamazoo River is notable for the great tragedy of historical industrial pollution with some of the most extensive contaminated sediments in the U.S. 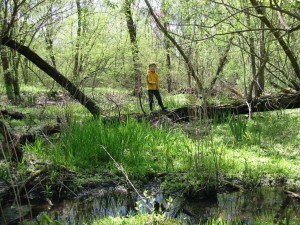 It is perhaps surprising, then, that this watershed also harbors some of the best preserved examples of Midwestern United States habitats including headwater streams, wetlands, and floodplains, and has several large areas of contiguous forests and grasslands that are publicly accessible in state parks and game areas. There is growing interest among residents and governments in the region to clean up existing pollution and prevent new problems. 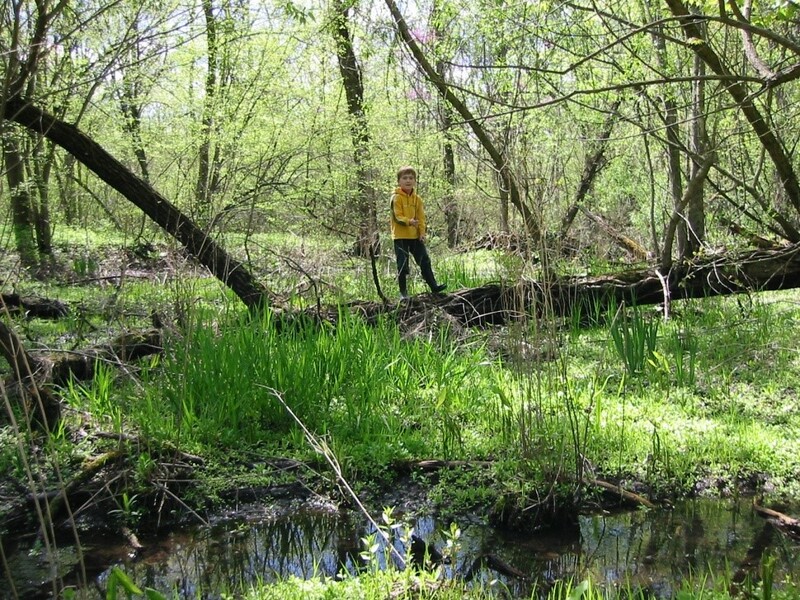 People have come together with the help of the Kalamazoo River Watershed Council to develop several long-term plans for restoring and protecting the valuable natural resources connected with the Kalamazoo River. Discharges into the Kalamazoo River from some paper industry recycling created very serious contamination problems prior to the 1970s. The primary contaminant is a class of synthetic industrial compounds called polychlorinated biphenyls or PCBs, for short, a hazardous substance and probable human carcinogen. PCBs were introduced to Portage Creek and the Kalamazoo River through disposal of PCB-contaminated paper residuals and associated drainage. The disposal areas (now often referred to as landfills) are situated on the river banks and contain millions of cubic yards of PCB-contaminated waste. The contaminated sediments were largely deposited in reservoirs along the Kalamazoo River downstream of source areas (e.g., Plainwell Dam, Otesgo City and Township Dams, Trowbridge Dam, and Calkins/Lake Allegan Dam). Read more about the legacy of contaminated sediments. In 1987, amendments to the Great Lakes Water Quality Agreement were adopted by the federal governments of the United States and Canada. 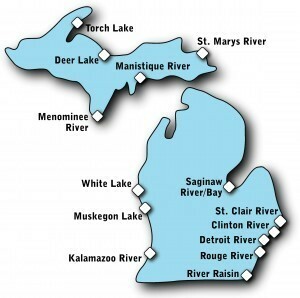 The agreement named 43 major rivers and harbors as “Areas of Concern” (AOC) throughout the Great Lakes because of serious water quality concerns. The Kalamazoo River was among the 43 AOCs because of the 80-mile stretch of river that has high levels of PCBs at the bottom and within the streambanks. The bi-national agreement was a promise by each country to cleanup the AOCs to protect the Great Lakes and restore the beneficial uses our residents and wildlife depend on from the lakes, rivers, and harbors. The Kalamazoo River has several serious environmental impacts from the PCB contamination that must be addressed before the river is considered to be fully restored. Problems include bird and wildlife deformities and reproductive issues, fish that are unsafe to eat, degraded fish and wildlife habitat, and restrictions on dredging. Remedial Action Plans or RAPs are the primary tool state and federal agencies use to document and track progress toward restoring AOCs. Download a copy of the Kalamazoo River RAP to read more about the environmental problems and progress to-date. The RAP describes how restoration of the Kalamazoo River AOC is heavily dependent on the ongoing cleanup of PCBs as part of the Superfund process. By removing PCBs and keeping them out of the river, it is expected that concentrations in fish tissues and other wildlife including birds will go down over time. The AOC will require other restoration efforts such as removing large dams along the river to improve fish habitat. Several of the large dams along the river today would not be there except large amounts of PCBs are deposited behind them awaiting cleanup through the Superfund program. Dams have detrimental effects on aquatic communities in rivers. They impede fish movements, fragmenting fish populations and blocking spawning migrations. Some of the most problematic and decrepit dams along the Kalamazoo River hold back high volumes of PCB-contaminated sediments. There are more than 100 dams in the Kalamazoo River watershed registered under Michigan DEQ with 13 on the Kalamazoo River mainstem. 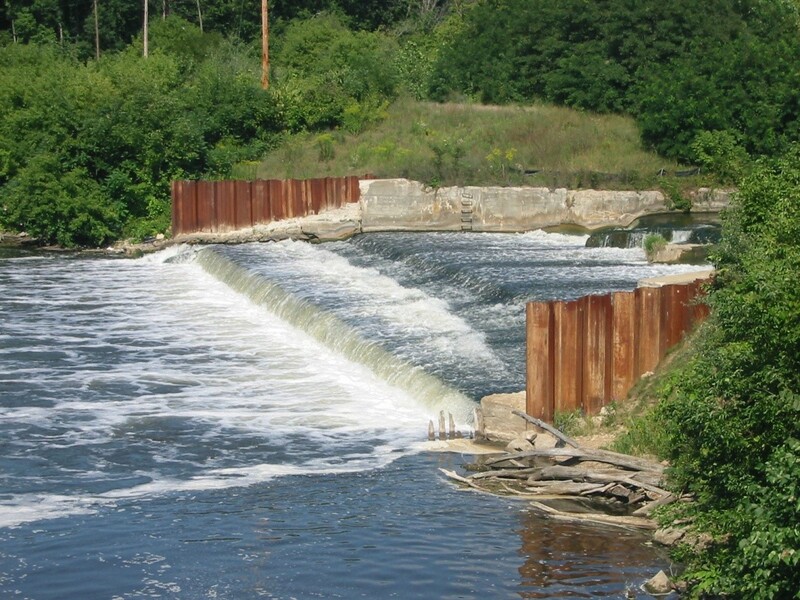 Not all dams are required to be registered with the state and many smaller, unregistered dams are scattered throughout the tributaries and headwater streams of the watershed. The first dams were built across small creeks at high gradient locations to power grain and saw mills. Read more about Dams Along the River. 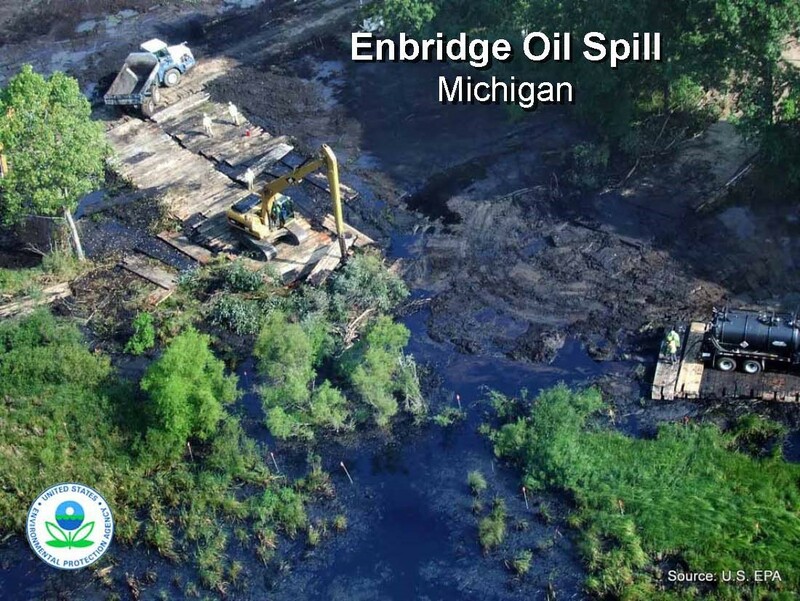 In July 2010, a massive oil spill was discovered in Talmadge Creek, a small tributary to the Kalamazoo River near Marshall, Mich. 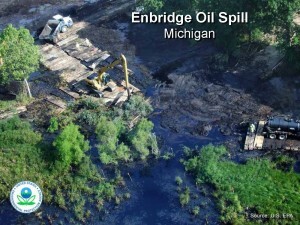 It was the result of a ruptured pipeline managed by Enbridge Energy Partners, LLC. Up to a million gallons of tar-sands crude oil was released into the creek, which contaminated a 30-mile stretch of the Kalamazoo River in excellent ecological condition. The magnitude of the oil spill made it one of the largest in-land oil spills ever experienced in the United States at the time. Read more about the oil spill. The water quality of the Kalamazoo River has greatly improved since passage of the Clean Water Act in 1972 and subsequent implementation of sewage treatment technology. Many communities and industries throughout the region have continuously worked to improve water quality by taking measures to reduce sources of pollution to the river. And yet there are still periodic problems with algae blooms and poor water quality during spring and summer months in reservoirs along the Kalamazoo River. Read more about algae blooms and nonpoint source pollution. Wetlands are inextricably linked to our surface water and ground water resources in the watershed. They provide important functions, values, and ecosystem services to the people and wildlife living in our region. 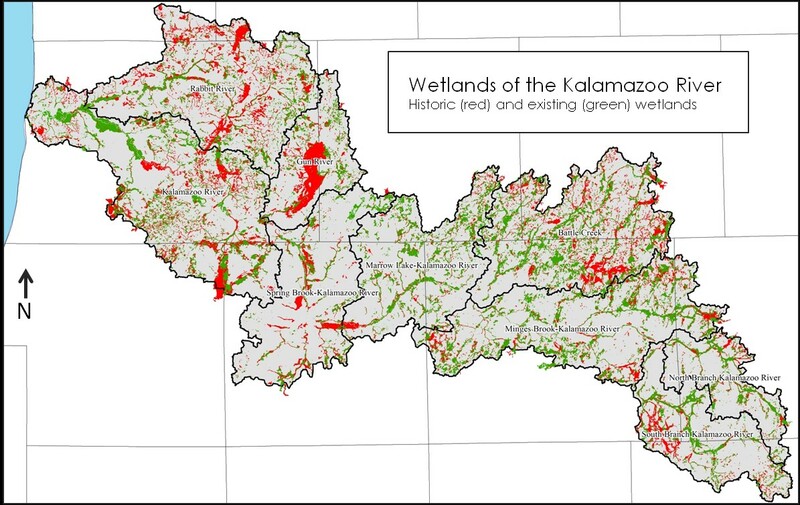 Within the Kalamazoo River watershed we have lost more than 94,000 acres, or around 40 percent of wetlands since settlers first arrived in the region. The average wetland size has decreased from 22 acres to only 6 acres in size, meaning important wetland habitat has become very fragmented. The loss is due to land drainage and conversion to agriculture, suburban, and urban uses. The results are often increased flooding, soil erosion, degraded fisheries, degraded water quality, and loss of wildlife and recreational opportunities. A variety of federal and state legislation has been enacted to slow the loss of wetlands to drainage and filling, scientist realize that many wetlands are still being degraded by more insidious threats, such as nonpoint source pollution and invasion by exotic problem plants. Current legislation is lacking when it comes to smaller wetlands less than five acres in size, which is a common size in many areas of the watershed. Wetlands play an important role in the maintenance of good water quality, especially where they lie along lakes and streams because these can intercept groundwater and surface runoff flowing towards surface waters, retaining nutrients, sediments, and contaminants from the water. Wetlands are particularly effective in removing nitrate, which is increasingly found at undesirably high concentrations in local groundwater aquifers. Riparian wetlands help to attenuate floods, as discussed earlier with regard to streams, thereby stabilizing stream channels and reducing property damage downstream. Historically drained wetlands offer possibilities for restoration. 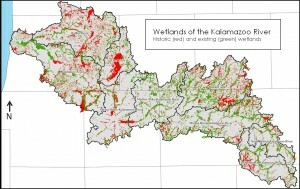 The most extensive areas of drained wetlands can be seen in red on the map. Such areas were drained for agriculture and some are still farmed today while others have been abandoned. Around 60 percent of the wetland resources found in our watershed prior to European settlement still exist today. They appear in green on the map. Check out the wetland tools available for local governments, planners, and others interested in better understanding your local wetland resources. 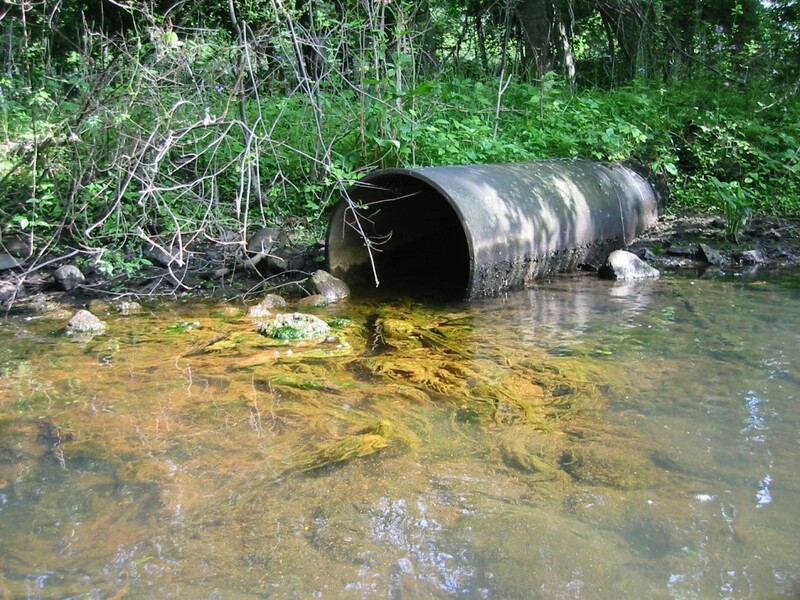 Several sites throughout the watershed have been documented for dioxins and mercury in fish tissue at levels of potential concern, specifically when people catch and eat fish from these sites. These locations show no obvious correspondence with current or former industrial activities. The causes and consequences of this apparent contamination of aquatic feed webs remain to be discerned. Mercury impairs fish consumption in most inland waters of Michigan and is source mostly from coal-fired power plants. The state is addressing this through air permitting and has issued a statewide TMDL for mercury. Heavy metals are a common contaminant of concern at former industrial sites, landfills, and in urban soil in general. Though PCBs are the contaminant of concern in the AOC designated areas, heavy metals are often cited as a concern by local communities, especially those with a history of manufacturing and heavy industry. Within a watershed, water quality can vary greatly from one water body to the next. The federal Clean Water Act requires Michigan to prepare a biennial report on the quality of its water resources as a principal means of conveying protection and monitoring information to the U.S. EPA and Congress. The report classifies water bodies by specific uses which all water must be protected for, including things like agriculture, industrial water supply, public drinking water, navigation, warm water and cold water fisheries, wildlife use, and human contact with water (e.g., swimming). Water bodies are then ranked as fully supported, non supported, or not assessed. Uses that are not being supported go on to list the specific reasons and pollutants or environmental problems. These water bodies are considered to be “impaired” due to the environmental problems. A full list of the impaired water bodies in the Kalamazoo River Watershed can be found on the Michigan DEQ Integrated Report website. The Kalamazoo River Watershed Council always welcomes volunteers. Register your interest today! Make a donation to support water conservation. You can make a secure donation using a major credit card. Or visit our support page to mail your donation. The Kalamazoo River Watershed Council is the assumed name of this organization, which was incorporated under the name of the Kalamazoo River Watershed Public Advisory Council in 1998. Our Tax Exempt Identification Number is 38-3458206.